As long as I talked about Japanese art last week, I might as well stay in Japan after coming across this gem in our digital collection. Years ago someone talked about the earth being a global village. Well, that didn’t just happen because of airplanes and the internet; I believe it started in the late 19th century. After the US forced the opening of Japan to western markets in 1853, the West was flooded with Japanese art, particularly the woodblock Ukiyo-e prints of the nineteenth century. It had a huge impact on western art at a time when western artists were questioning the “tradition” of western styles and iconography. Who would guess that Japanese influence on western art would boomerang? I’ve already talked about Japanese postcards in a past blog. What I find fascinating about this postcard is the cross-cultural influences. After being forcibly opened to the West, Japanese artists were exposed to western art styles and techniques. Many artists incorporated western perspective into their work, while some adapted western media such as oil paint. One of the most prominent Japanese oil masters was Asai Chu (1857-1907). In 1900 he was sent by the Japanese government to Paris to attend the Exposition Universelle in which his work and the work of other Japanese artists were featured. He became fascinated by the then-current style of Art Nouveau and transmitted that style back to Japan. By 1902 the style was very popular in Japan, gracing not only postcards, but many other forms of graphic arts. Asai Chu was struck by the fact that western artists of the Art Nouveau style were particularly interested in the work of Ogata Kōrin (1658-1715). 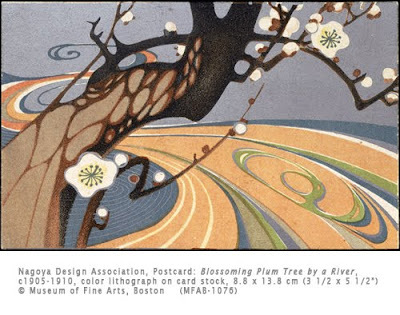 Also, artists who worked in the Art Nouveau style had borrowed motifs from Japanese woodblock prints, which had an angular, linear look, incorporating the grids and parallel lines of Japanese interior design depicted in these images, as well as the sinuous, flowing lines of blossoming tree branches, rivers, and kimono designs. The elegant refined detail of work evident in these and other artworks from Japan gave a new aesthetic input, feeding western desire for a new style/decoration for a new century. Another interesting aspect of this piece is the use of lithography. The first printing press was introduced by Germany in the 1860s. Before that the only printing technique used in Japan was the woodblock. By 1873 the use of lithographs was popular in Japan. It was similar to woodblock printing in that color lithography required a different stone for each color. After 1882, more private publishers used lithography than woodblock prints for postcards, etc. In 1885 they organized the Tokyo Lithograph Union. Lithography had the advantage of being easier to use for mass production than woodblocks. Let’s sum all this artistic influence flow up shall we? Japan to West to Japan. There you have your “holy cow!” moment of the week. Check out more Art Nouveau Japanese postcards from the MFA Boston’s phenomenal collection of the genre.